Many won't be surprised to see On Top of the World on top of this list. Wondering which communities in Central Florida were most interesting to active adults in 2018? We checked the clicks and analyzed the page views for January 1, 2018 to December 31, 2018, and we’re ready to tell you where in this sunny region of Florida people most frequently think about living. It’s no surprise that On Top of the World, a sprawling collection of 10,000 homes in Ocala, is the most popular community visited on 55places.com. It has something for every budget and every lifestyle, and it’s located in one of the prettiest parts of Central Florida. Ocala is known for horses, nature trails, the Appleton Museum of Art, and the Ocala National Forest. At On Top of the World (or OTOW as it's known locally), 55+ residents can select a resale home or new construction. The community recently began offering Amazon Smart Home services to new homebuyers, and amenities are offered all over the property, from the Recreation Center to the Hobby Building and throughout all the community centers. Hundreds of clubs and activities are regularly offered, including travel excursions, movie nights, and continuing education classes. Solivita is a popular 55+ community among golfers and active adults who appreciate luxury amenities and opportunities for fitness. The Stonegate Golf Club is semi-private and features two beautifully landscaped 18-hole golf courses. There’s also a spa and fitness center that includes an indoor walking track, a gym, and a dance studio. Clubs for every hobby and interest meet at Solivita, from painting to canoeing to birding. There’s a farmers market every week, and lessons in yoga, swimming, Zumba, and other forms of exercise. If you prefer to exercise solo, you’ll find every machine necessary to increase your strength and improve your cardio fitness. Buyers can look at new and resale single-family homes and attached villas. AV Homes is building 5,900 properties that range in size from 900 square feet to over 3,000 square feet. The community is in Kissimmee, which is just outside of Orlando and an easy trip to either coast. There’s shopping, dining, plenty of parks, and Old Town, an old-fashioned theme park designed to look like any American Main Street. 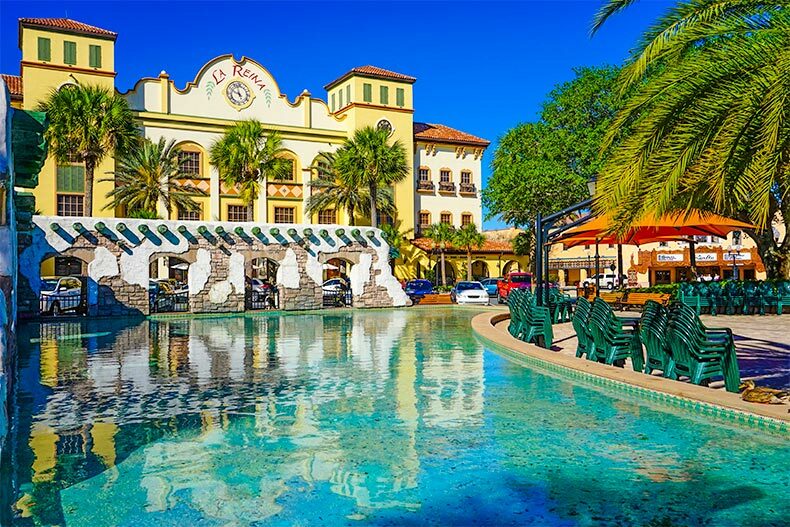 It might not have the name recognition that some of the other communities on this list possess, but Oak Run is a popular 55+ community in Central Florida for a number of good reasons. It’s in a scenic area covered in lakes, forests, and even hillsides. The Royal Oaks Golf Club offers an affordable and friendly place to hit the links, and a full-time activities director is on site to ensure there’s always something to do. Over 100 clubs are represented, and residents are often found line dancing, attending Bible study, playing shuffleboard, or doing yoga. There are Super Bowl parties and concerts. New and resale homes are available as single-family or attached models. Duplexes have two or three bedrooms, two bathrooms, and two-car garages. The single-family homes are sold in 20 different floor plans, with two bedrooms or three bedrooms, and some of them with dens. Oak Run is popular because it has all the amenities and features of a large community but still feels intimate within its neighborhoods. 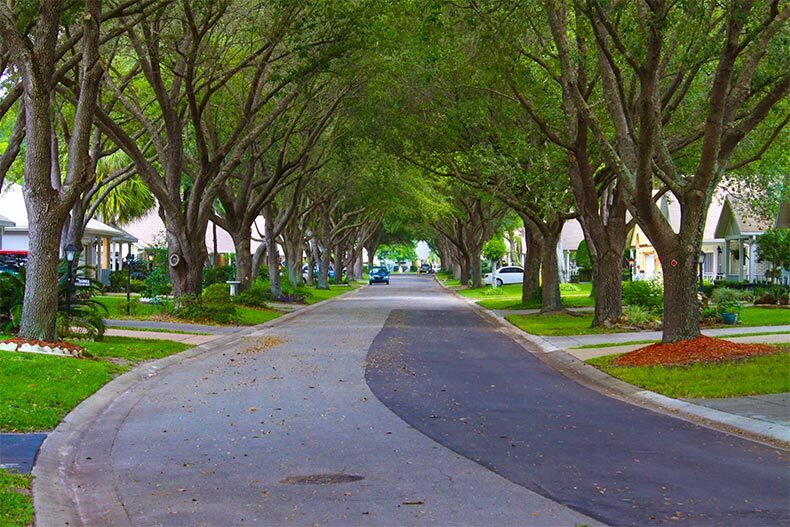 The Villages is more than just a 55+ community, it's a town, a society, and a lifestyle. It’s hard to compete with The Villages, whether we’re talking about size or popularity. This is more than a community; it’s an entire town. At The Villages, new and resale homes are voluminous – at 56,268 properties. Active adults can travel through three counties and three separate zip codes just by moving from one end of The Villages to the other. As you can imagine, people love living here. They have privacy, a strong sense of community, and enough amenities and recreation to make leaving the area somewhat ridiculous. With nine places of worship, numerous fitness centers, more than 50 outdoor pools and over 60 restaurants, everything you need is right here at home. There are nine softball fields, three movie theaters, and a couple of bowling alleys. The Villages has three town squares, a woodworking shop, space for gardening, and several local farmers markets. When it comes to choosing a home, there are bungalows and cottages and villas. Single-family homes and manufactured properties are also popular. Its popularity is due to the choices residents have. You’ll never run out of options at The Villages. Stone Creek is another Ocala 55+ community that earned a spot on the popularity chart, and it’s no doubt due to builder Del Webb’s reputation for creating outstanding homes with impressive amenities. If you want something that’s a bit more low-key than The Villages or OTOW, consider a place like Stone Creek, with its modest 3,800 single-family and attached homes. They range in size from 1,100 square feet to 2,600 square feet, and new construction is available in many models. Reflection Bay is the cornerstone of amenities for residents, with pickleball courts, horseshoe pits, a meeting room, a ballroom, and a 22,000 square-foot Reunion Center. The Elan Spa & Resort area has an indoor and outdoor pool, a sauna, locker rooms, a fitness center, and massage appointments. Stone Creek Golf Club is a public course that welcomes residents, and includes a putting green, driving range, and restaurant.